Support the creation of Vega-Lite visualizations in Haskell. This code is released under the BSD3 license. It is an almost-direct copy of version 2.2.1 of the Elm Vega library, which is released under a BSD3 license by Jo Wood of the giCentre at the City University of London. bkg = background "rgba(0, 0, 0, 0.05)"
The Elm Vega documentation can be used as a guide to using this module. 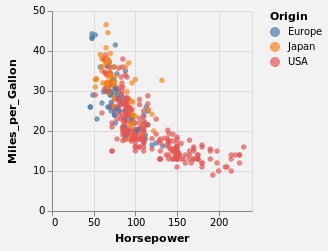 The Vega-Lite Example Gallery has been converted to an IHaskell notebook Uunfortunately the plots created by VegaEmbed do not appear in the notebook when viewed with either GitHub’s viewer or ipynb viewer, but things seem much better when using Jupyter Lab (rather than notebook) to create the notebooks (since Vega is natively supported in this environment). The notebooks have been re-created using Jupyter Lab (thanks to Tweag I/O’s JupyterWith environment), which should make the plots appear on GitHub (you may need to reload the notebooks as I find they don’t display on the first try). The notebooks directory contains a poorly-curated set of examples and experiments with hvega. Replace Spec by VLSpec (although both are synonyms for the underlying JSON representation). Add a type for the output of toVegaLite (VegaLite) that is separate from VLSpec, which is usefull for integration with IHaskell. The JSON specification is retrieved with fromVL. Take advantage of the lack of backwards compatibality requirements to remove or replace several symbols (such as add the Utc constructor to TimeUnit, remove the bin function, and use Data rather than (VLProperty, VLSpec) in function signatures). In version 0.2.0.0, the constructors for the LegendOrientation type have gained a LO prefix, which avoids clashing with the Prelude’s Either type. For the latest version of this document, please see https://github.com/DougBurke/hvega/blob/master/hvega/CHANGELOG.md. The constructors for the LegendOrientation type have been renamed (by adding the prefix LO) which avoids the name clash with Left and Right seen in earlier releases. This is a breaking API change. Clarify how to use the library in the main hvega module. Thanks to contributions from Nicolas Mattia (nmattia) and Marco Zocca (ocramz). The only change is to the cabal file, where cabal-version: >=1.18 has been changed to cabal-version: 1.18. Updated the upper bounds of aeson to really allow v1.4. This was not released on Hackage. Updated the upper bounds of aeson from v1.2 to v1.4. The cabal package now includes stack.yaml and default.nix (although the latter is not guaranteed to be correct), as well as a change log and an extra image. This is the initial version of hvega, which is based on version 2.2.1 of the Elm Vega library.